Oak Park, CA / Tengchong, China – BADWATER®, the world’s toughest brand, is pleased to announce the inaugural Mt. Gaoligong Ultra in Tengchong, Yunnan Province, China on November 18-19 of this year. The 104-mile (168km) challenge – with a 36-hour time limit and 29,000 feet (8800m) of elevation gain – is a mountain trail race through history and time. As befits anything that Badwater is developing and backing, the Mt. Gaoligong Ultra is extremely difficult, with well over 29,000 feet (8800m) of cumulative elevation gain, and a corresponding loss of more than 29,000 feet. It will be held primarily on mountain trails, including single track, double track, jeep roads, and some cobblestone paths. 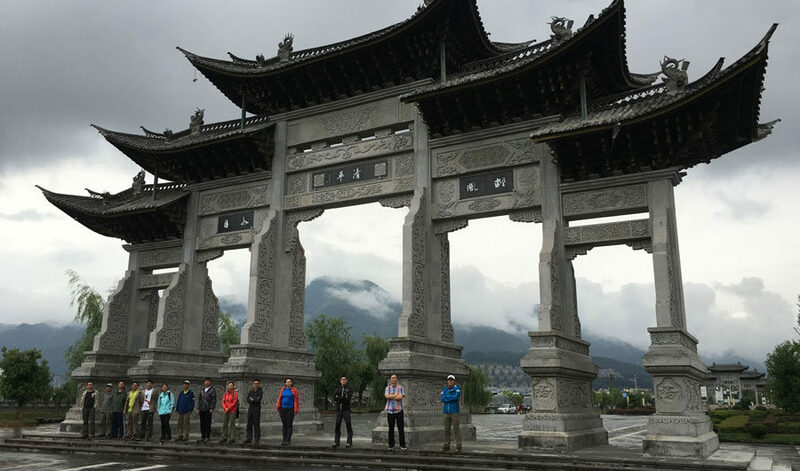 The start line will be at the Yin and Yang Gates in WenZhi-GuangChang Square in Tenchong – allowing the racers to balance their energies as they embark upon this epic challenge – but quickly disappears into the Mt. Gaoligong National Park and mountain range in all its green grandeur covered in trees, bamboo, ferns, and the occasional rice paddy. Sections of the route traverse the 2400-year-old Southern Silk Road, while the Stillwell Road, a critical supply line built by the Americans during World War II, is also part of the race route. (Americans are particularly appreciated in Tengchong, in part because of the Stillwell Road, and also because the Flying Tigers – American pilots who volunteered to fly for the Chinese during WWII – were based here. (A large sculpture commemorates them outside the Tengchong Airport.) The finish line will be in 600-year-old HeShun Town, the ancient, cobblestone part of Tengchong, providing a historic and exhilarating final few miles for the racers as they complete their historic tour. The race will be fully supported, with a marked trail, 14 fully stocked aid stations, drop bag service, and more; personal support crews are neither necessary nor encouraged due to the remoteness of the route. Though the main event will be the full 104-mile route, a 77-mile (124km) “short cut” route will be offered mid-race for those not on schedule to finish the entire route within the 36-hour time limit. Registration for the event is already open, and many well-known Badwater race veterans have already registered. These include Americans Bob Becker, Catra Corbett, Jimmy Dean Freeman, Jared Fetterolf, Joshua Holmes, Andrea Kooiman, Greg Pressler, Ray Sanchez, and Danny Westergaard, plus Luigi Dessy of Puerto Rico, Mick Thwaites of Australia, Dan Lawson of the United Kingdom, Mauro Chasilew of Brazil, Stacey Shand of Canada, Breze Sharma of India, and Hiroyuki Nishimura of Japan. This new race is not a Badwater® race, per se, but it is a “Badwater Presents” event which Chris Kostman, the Badwater Race Director, is helping to develop and for which he serves as co-race director. Kostman’s Chinese partners, XingZhi Yunnan Co. Ltd, are absolute professionals and extremely enthusiastic to host a world-class event this November, and annually thereafter. Kostman’s Chinese co-race director, Lin Ma, is rock solid and Kostman’s nickname for him is “Mr. Cool.” Even though his English is minimal and Kostman’s Chinese is even more non-existent, they both speak the same language when it comes to developing and hosting incredible, life-changing sporting events. Another of the principals from XingZhi, Margaret King, recently attended the STYR Labs Badwater 135, which Kostman directs. She and her colleagues work for XingZhi, a China-wide event production company helmed by Xiangdong (Ben) Qu, with over a decade of experience hosting scores of multi-day endurance events with up to 2000 entrants. All their events emphasize the crossroads between sport, culture, and tourism. Hired as a consultant because of this 32 years of developing world-class – and world-famous – ultra events, Kostman spent eight days in Tengchong in June consulting on every aspect of the race, from routing to start line and finish line, trail marking, aid stations, medical support, communications, marketing, and more. Said Kostman, “I literally spent a full week teaching ‘the Badwater Way’ of creating, hosting, directing, managing, and marketing events. Fourteen to eighteen people shadowed my every move and took about a hundred pages of notes! On top of that, I was absolutely blown away by the entire route, the historic setting, and even more so by my Chinese partners!” Since June, Kostman and his Chinese colleagues have been having regular WeChat video conferences to work together to develop the race. In November, Kostman will be spend a full month in China to help host and direct the race. Further collaborations there and elsewhere in China are already in development. For 2016 Mt. 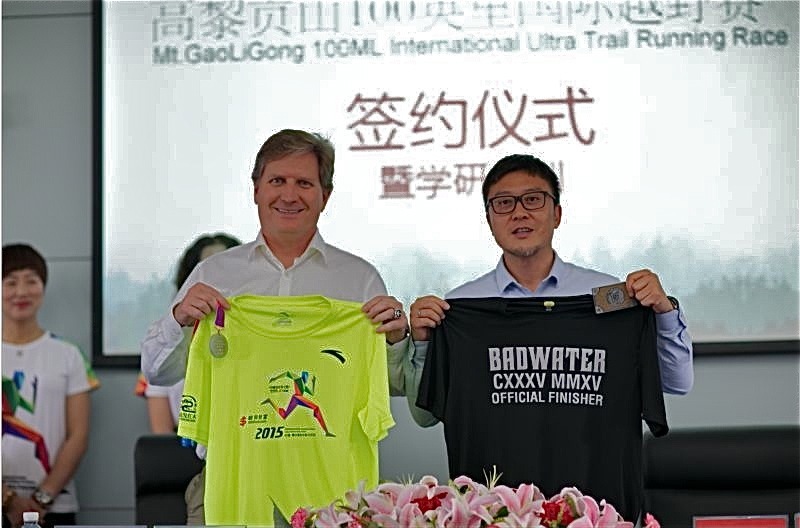 Gaoligong Ultra race results and live GPS tracking, click here. Co-Race Directors Chris Kostman and Lin Ma exchange gifts during the Contract Signing Ceremony at Tengchong City Hall on June 13, 2016. The race is also featured here on the Badwater website.